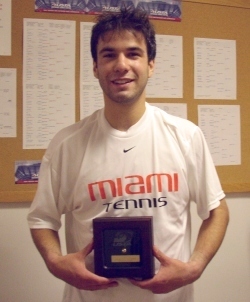 Simon Rea of Tennessee attempted to win a thrid New Zealand National singles title in a row. Unfortunately, he was stopped in the final by fourth-seeded James Shortall. The senior wants to earn a place on New Zealand's Davis Cup Team. Coaching Changes... After a season and a half as head coach at Birmingham-Southern, Michael Metz has returned to Mississippi State as Assistant Men's Coach.